In Flagstaff, the oldest continually run Catholic school in the state now boasts an award-winning preschool. While the school itself includes classes up to grade eight, the preschool is preparing local three- and four-year-olds for their foray into kindergarten. 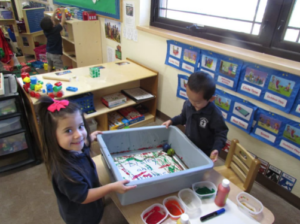 With two preschool classrooms for 39 students, San Francisco de Asis Catholic School (SFdA) was recently honored with a five-star rating through Arizona’s First Things First Quality First program. The rating is the highest available and a first for the First Things First Coconino region.